March 26, 2016…..A day I will always remember. I did what I once thought was unthinkable. I took a sip of a beer and could go no further. I had to dump it down the drain (insert frowny face emoticon, maybe even the one with a tear to properly put things into perspective). Here is the thing. I always finish the beer, no matter how bad it is. The now defunct Crazy Ed’s Cave Creek Chili Beer – finished. The Miller Lite served out of a tap line that hasn’t been properly cleaned in over a year – consistently drank with a smile on my face. Straub (in the green bottles) that had been sitting out in the sun a little too long – more times than I would care to share. An interesting sounding six pack that turns out to be subpar at best. That one may take me a couple weeks, but I will finish it. But alas, on March 26, 2016…..I met my match. Ballast Point Indra Kunindra, you have bested me, and for that, I will never forget (or forgive) you. 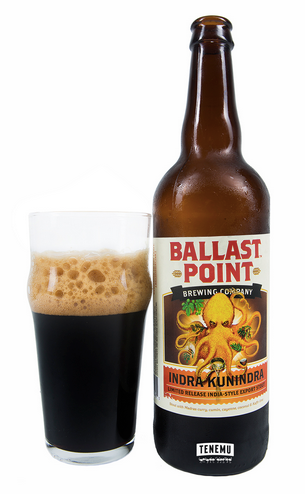 This is not a hit piece on Ballast Point and/or the Indra Kunindra. I actually take some of the blame myself. In my haste, I saw “Ballast Point”, “Limited Release” and “India” and mistakenly thought it was an IPA. Boy was I wrong. It is actually an India-style Export Stout. What could this possibly mean? Surprisingly, exactly what you think it may mean. The beer is brewed with madras curry, cumin, cayenne, coconut and kaffir lime leaves. The minute you open the bottle, you are instantly transported to the kitchen of an Indian restaurant. This is not a bad thing, but it’s just not something you would expect to find in liquid form. The brewers over at Ballast Point actually did a remarkable job, brewing exactly what they set out to do. I just was not ready for it, and I don’t think will ever be ready for it. If you have ever found yourself staring at a giant plate of Indian food, quietly thinking to yourself, “Boy, this looks great! I just wish I didn’t have the chew. It can be so tiresome. I wish I could just drink the contents of this plate,” this beer is for you. For me, this time the drain pour was my only option. Wow! I love everything else that they brew. Looking forward to trying Dave’s brews! The best of both worlds! Indian food and beer! If only our Indian brethren at Fox and Hounds knew about this 16 years ago! Rajat would have loved it. I wonder where he is these days? Thank you for reading. You are right…you probably won’t be finding Little Kings on here anytime soon!